Hey guys and welcome to part two of this update. Sorry for the delay in the update I was having a hard time writing the post. If you made it this far you are interested to know how I feel about a little movie we share a mutual interest in. I have said this before that this is probably my favorite Naruto movie. I think that the series of movies gets progressively better. I would have said that Road to Ninja is my favorite but I felt really awkward watching it so I decided that my joy stopped with Blood Prison. Now if I will say that is true after the release of Naruto Shippuden movie 7 is unknown. Now what can I say about this movie. I certainly like the fact that they use the movie poster in a cameo scene in the show. I'll give you a hint as to where you can find it. Look in Killer Bee's room when he is talking to Omoi and Karui. It's there, trust me. You actually notice it in I think two episodes. Blood Prison begins with A in a meeting with Omoi, Karui, Samui, and Mabui. 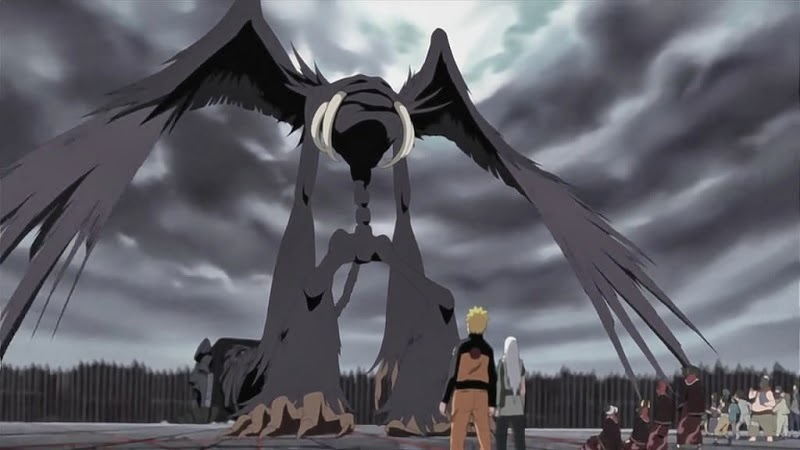 He is suddenly attacked by a hooded figure and after ripping off the hood he discovers that his attacker is none other than the Hidden Leaf's Naruto Uzumaki. Back in the Hidden Leaf shortly after the attack Naruto is standing before Tsunade having been called in for a serious matter. She explains to the young ninja about accusations of him being wanted in two villages and the accusation of his assassination attempt on A. Naruto argues with Tsunade that it wasn't him and turns to Kakashi, Yamato, Sakura, and Sai to get their help in proving his innocnence. When no one helps; Naruto is arrested, has his headband removed, and is taken to prison. The cool thing about Blood Prison is that it is a stand-alone movie. Kind of like Lost Tower, it doesn't try to play in with the storyline in some way. Bonds was pre-Sasuke killing Orochimaru because it shows the ill villain. Then Road to Ninja has its own episodes in the show as well as ties into Madara's plot against the ninja world. Yeah the original Shippuden movie didn't really tie into the series and neither did Will of Fire, but still there is a quality of Blood Prison and Lost Tower that just makes them worth it. 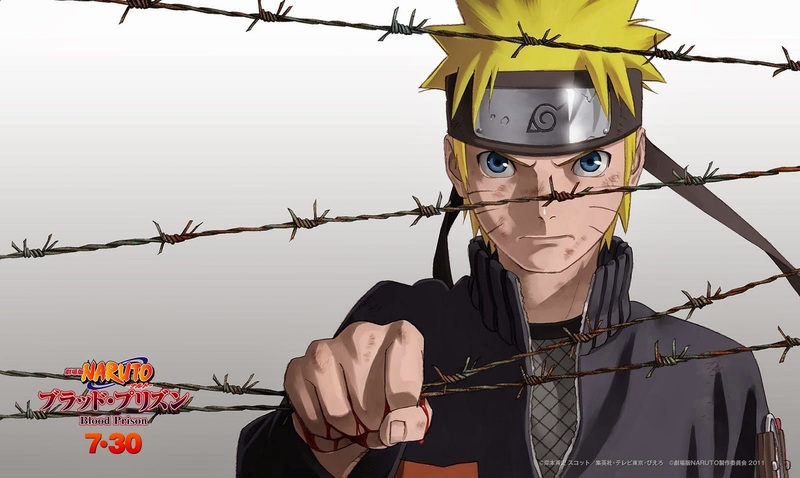 Blood Prison has all of your usual characters at the beginning and the end of the movie, but for the most part it is a movie all about Naruto. With the help of Ryuzetsu he is able to investigate and discover who framed him as well as stop the plot to ruin the world he knows. The main goal of most of this movie is to discover "The Box". A and his group talk about it in the beginning and Mui, the bad guy, has taken Naruto to open said Box. Naruto and Ryuzetsu have to find a way to stop Mui from gaining Naruto's chakra because he is a jinchuriki. Their biggest issue is that they cannot use their chakra due to a seal placed upon them the minute they entered the prison. Naruto soon discovers that the only way to fight is if he can enter Sage mode. Naruto winds up in Solitary Confinement after several fights and learns that this is the way he can gain the chakra needed to survive. So after a set-up fight by Naruto and Ryuzetsu, Naruto is able to leave a Shadow Clone in the Solitary room to gain Nature Energy. Unfortunately they learn that fighting Mui isn't enough, they need to kill him and find the box to take it away from the prison. As Ryuzetsu distracts the guards and attracts Mui, Naruto disappears to below the prison to the place where the Box is hidden. When he is about to discover the box he is captured by Mui and his companions. With Naruto now in enemy hands, the box is finally opened after they extracted chakra from the Konoha ninja. Naruto runs off in hopes to stop what is about to happen but is unable to when Mui reenables the chakra seal. Ryuzetsu and Naruto are up against Satori who has been born from the hatred that has taken over the heart of Muku. Muku is the son of Mui and the childhood friend of Ryuzetsu who was locked inside the box in hopes that his special chakra would be enough to open it. Satori then goes on a rampage stabbing Mui through the chest and tossing prisoners into the box. Before they know it help arrives. All of Naruto's friends including Killer Bee have shown up and explain to Naruto that the reason he was thrown in prison was to draw out the bad guys. Naruto feels relieved that his friends hadn't lost faith in him and has the will to fight once again. When it soon becomes clear that no one can defeat Satori, Naruto decides he must enter Sage mode once more. His friends then protect him as he collects chakra and soon he is able to lay punches on Satori. It turns out that the reason why no one can fight Satori isn't because he can read minds which is what everyone believes, it is because Satori can read fear. Satori relishes in fear and he can evade those who fight with fear. Ryuzetsu showed Naruto that when she was able to jump in front of Satori and throw him off guard. It was because she isn't afraid of Muku and she only wants to help her friend. Naruto explains this to Satori and prepares to land a massive blow to the creature. Satori turns on Naruto then, creating probably my favorite scene in the movie. 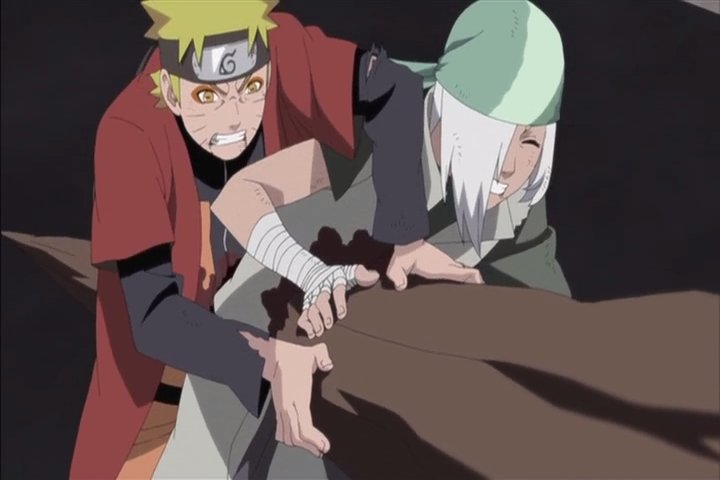 Naruto and Ryuzetsu, who jumped in front of Naruto hoping only she would get hit, were impaled by Satori's hand. The reason I love this scene the most is because of one thing...Minato and Kushina. DUH! This is yet again one more way of the creators showing us that Naruto is EXACTLY like his parents! Yes the circumstances are different but to be honest. It still strikes a cord in my heart. It also lead to the saddest part of the movie. When Sakura was crying over Naruto trying to heal him but was unable to. Tsunade walks over and says she will try, but Tsunade is stopped when Ryuzetsu walks up saying she can do it. Ryuzetsu crouches before Naruto thinking to herself about how much Naruto reminds her of a smaller version of Muku. 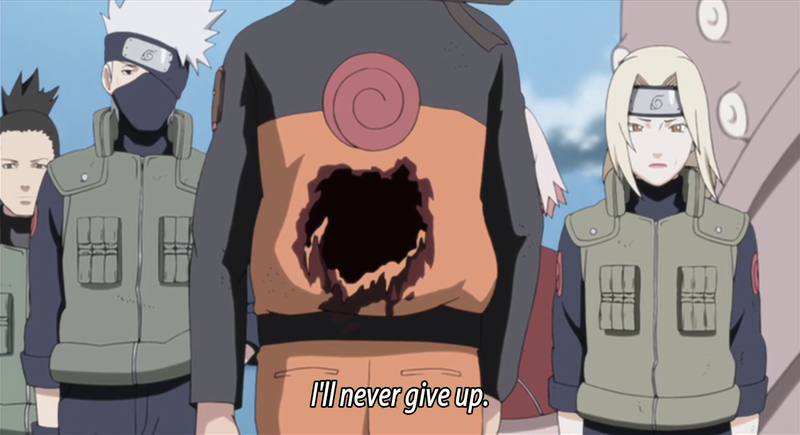 Sakura is in shock seeing Ryuzetsu's entire side torn out as the girl invokes a family jutsu that offers up one life for another (similar to Chiyo's) and then kisses Naruto transferring her life to his. Tsunade then resumes closing up the now revived Naruto's wound. Naruto half out of it talks about the dark place he was in while he was temporarily dead, then he asks for Ryuzetsu but Killer Bee distracts him from inquiring too much about the dead girl lying a few feet from him. 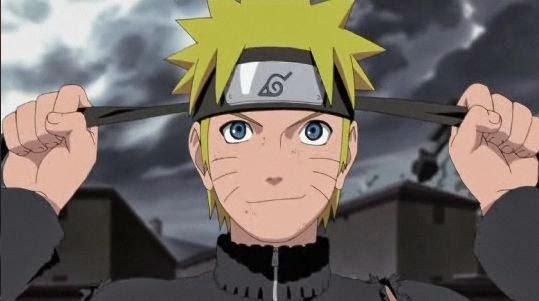 The movie ends with a sweet parting that is befitting of Naruto. Overall I think it is a wonderful movie and one of my favorites. It doesn't rely heavily on the normal characters and is simply a Naruto movie. Naruto finally gets the chance to prove himself without the help of his friends or even the help of Kurama. He shows a strength that we haven't seen in him since the Pain Arc and won't see again until later on in the Fourth War Arc when it finally resumes. Plus the score is very fitting and doesn't use a lot of the same music as the show (which is a real bummer in tv show inspired movies). Plus I think this movie helped a lot to foreshadow something that happens a lot later in the series. This is actually the first movie where Naruto actually dies. Hell it's the first time in the animation that he dies. That's what sets this movie apart. It sees a risk, it takes the risk, and it succeeds. This creates an amazing movie. What are your opinions? Do you like this movie? Do you have a different Naruto movie that you like? What do you wish they had done differently? Comment below or chat me up on Twitter. I'd like to hear what you have to say. I'd even like to hear if you want me to do another movie or anime review.